and an old sink attached to the wall with virtually no storage. 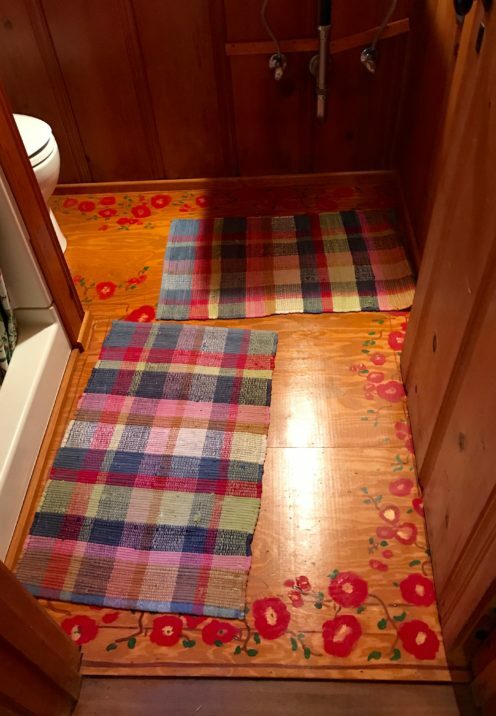 The plywood floor was painted with red flowers, and although someone spent a good deal of time painting that floor, it is not my taste or the color scheme I was going for in this house. 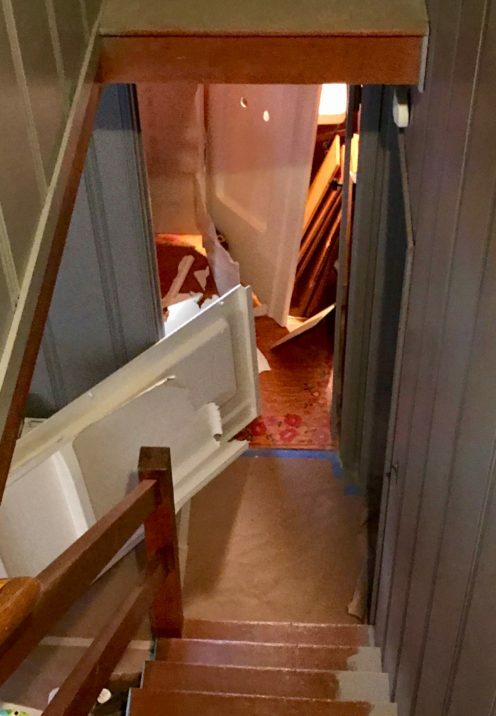 Instead I planned to paint the knotty pine walls in a rich caramel color, the same as the walls in the adjoining Guest Bedroom. 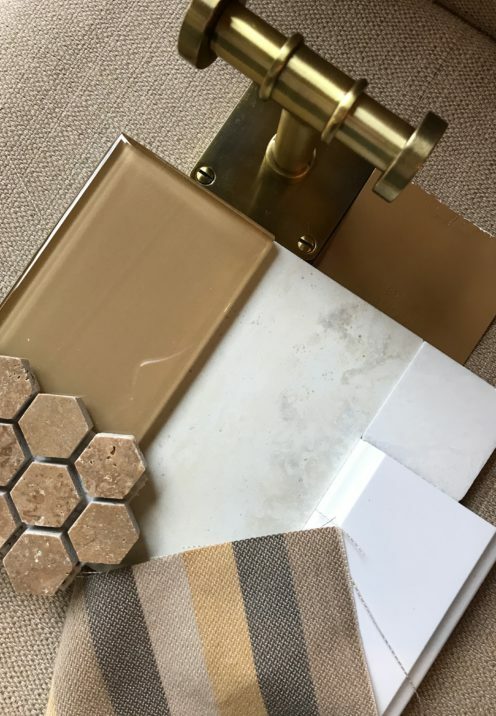 I chose a coordinating glass subway tile for the shower walls, a lovely 1″ hexagon mosaic in dark honed travertine for the shower ceiling and floor, a 12″ x 24″ ceramic tile called Nu Travertine in Silver for the floor, white wood for a sink cabinet I planned to build, and lovely, rich brass for the Pottery Barn bathroom hardware. Finally, I selected a coordinating fabric from Dorell Fabric Outlet for a window treatment. Big departure from the original wouldn’t you say? 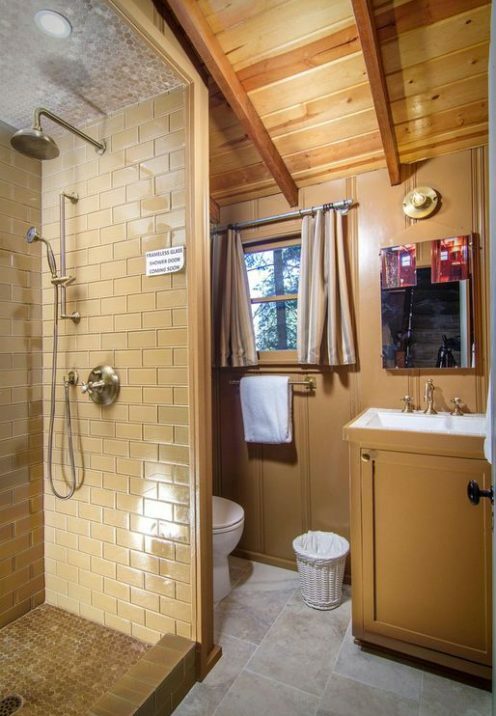 But still in keeping with the vintage flavor of the old cabin. On Demolition Day we pulled out that old fiberglass shower. Boy was I happy to see that go. 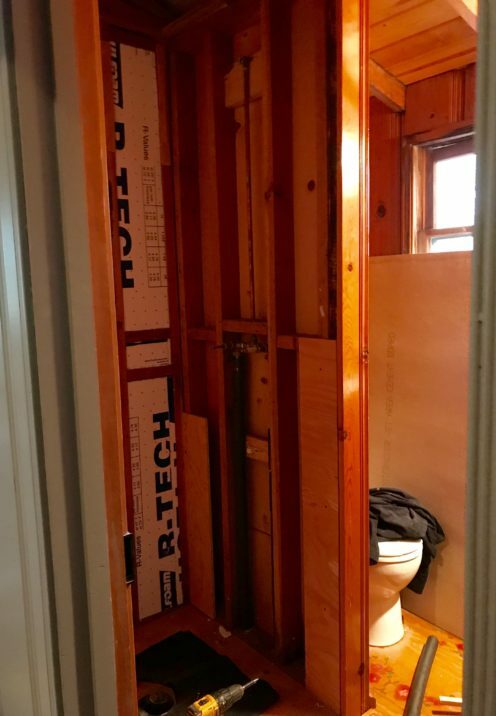 Next we added new copper plumbing and roughed in the new shower valve. 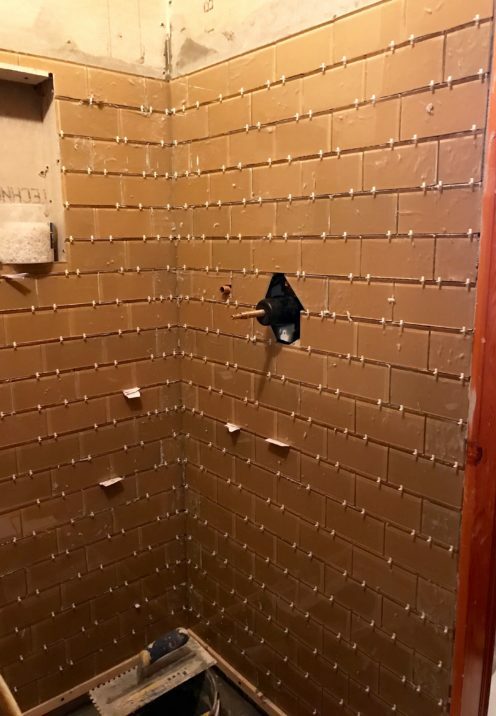 It’s always exciting when the tile starts to go in because then I get to see my design choices come to life. 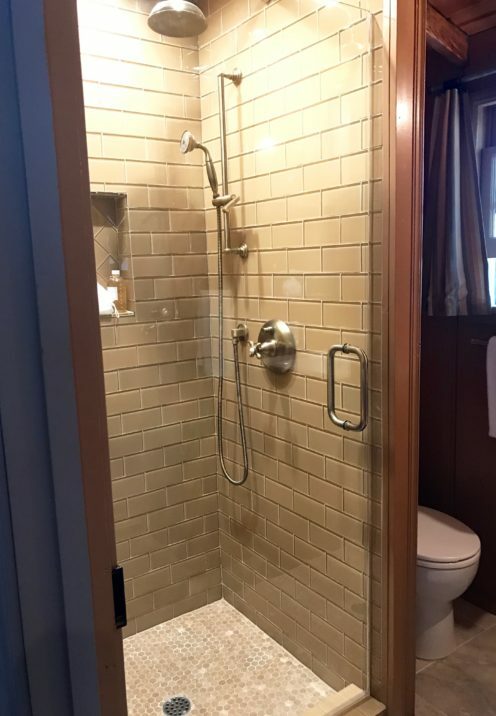 And here is the finished shower, complete with a beautiful frameless shower door. 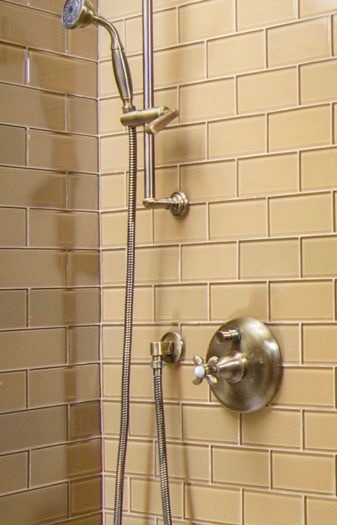 The lovely Pottery Barn Hardware is Langford Pressure Balance Cross-Handle, Hand-Held Shower Faucet Set in Brass, $1,999. Next the new tile flooring was installed, which was such an improvement over the painted plywood. 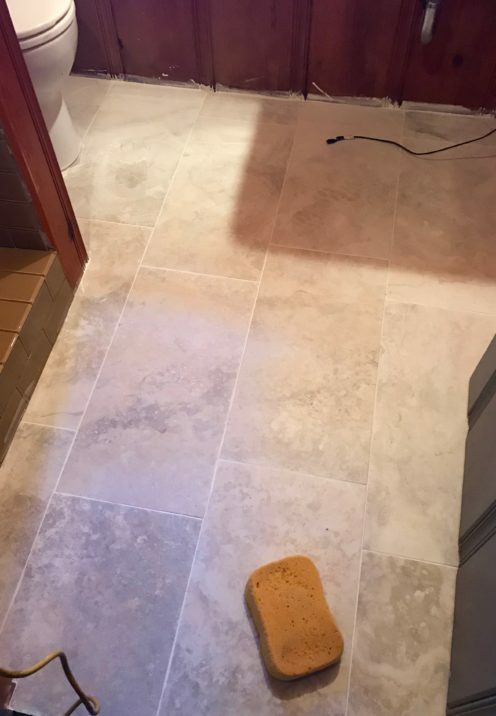 It’s a 12″ x 24″ ceramic tile called Nu Travertine in Silver Matte from Arizona tile. It picked up all the other colors in the room and could not have been more perfect. 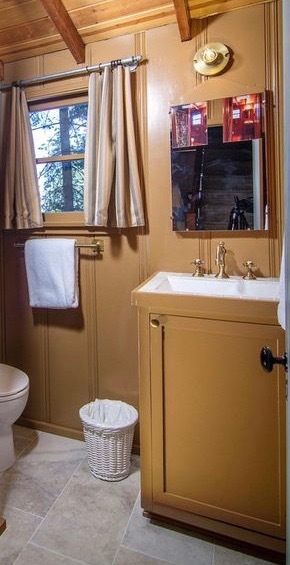 The knotty pine walls were painted in a warm colored, Behr Premium Plus Ultra Paint called Lavish Gold. 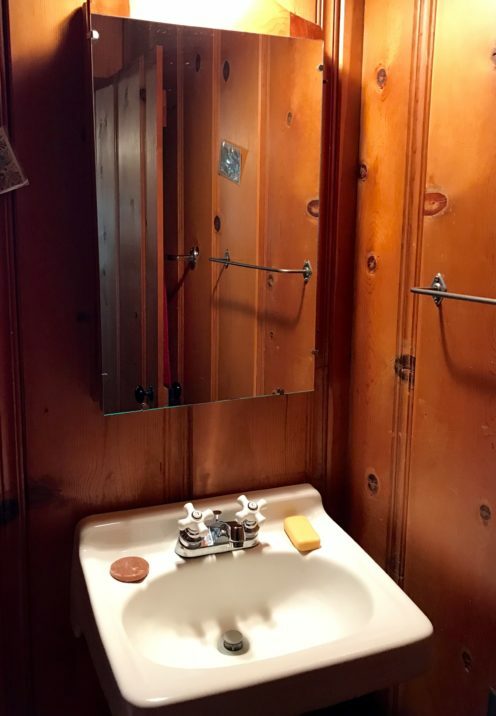 And a cabinet was constructed to house the new ceramic sink. 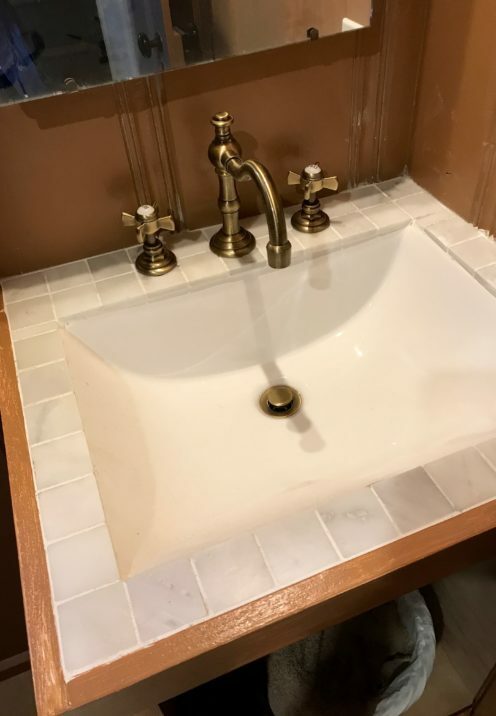 I purchased the Overton Rectangular Porcelain Undermount Sink from Signature Hardware, $150.95. And I used the same Grecian Honed Marble Mosaic Tile ($7.84 sq. ft.) that we used in the kitchen for the countertop. 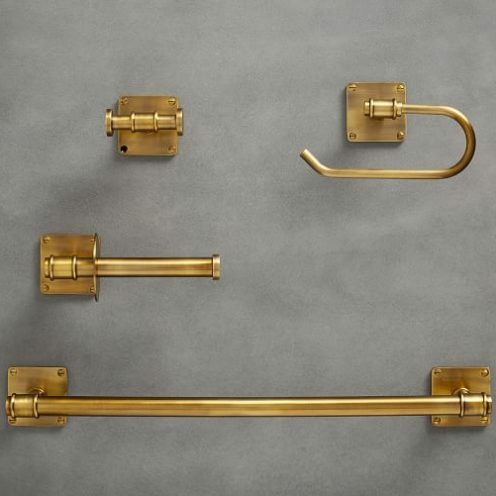 The beautiful Cross-Handle Widespread Bathroom Faucet in Brass is by Pottery Barn, $599. 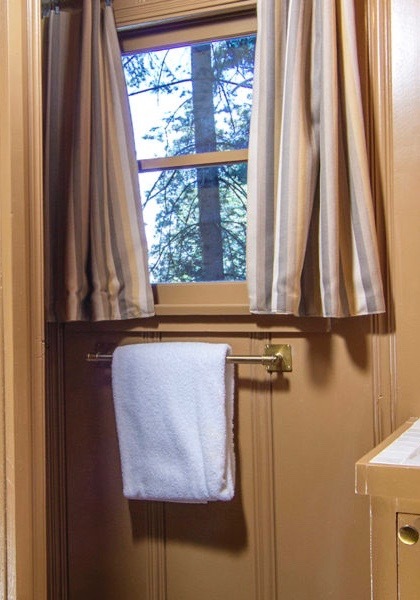 Finally I sewed the window treatment and installed Pottery Barn Vintage Towel Bars in Brass that come in a set of 4 accessories, $129. 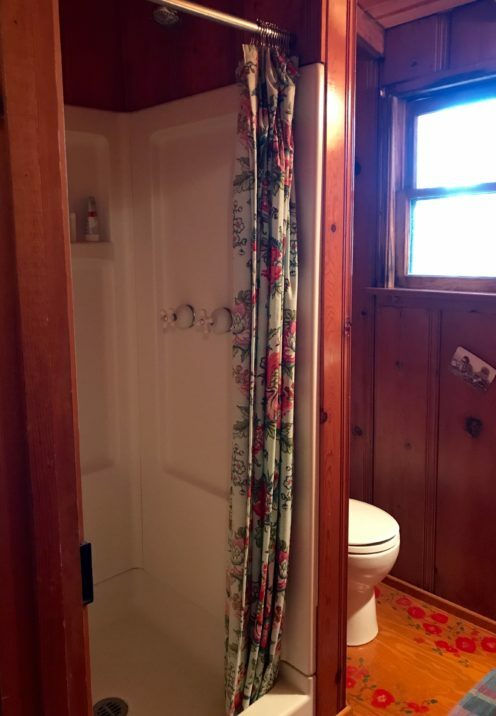 And here is my completed bathroom. 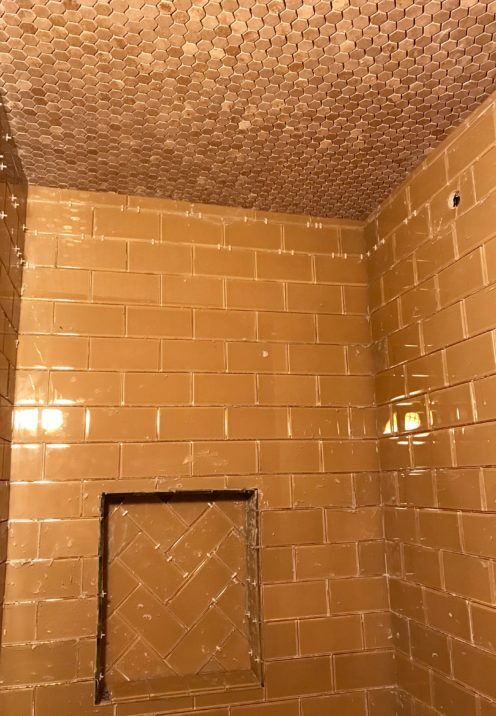 3″ x 6″ Glass Subway Tile in Caramel MS International from Home Depot $8.97 Sq. Ft.